STOCKHOLM -- Two researchers at American universities have been awarded the Nobel Prize for economics. Yale University's William Nordhaus was named for integrating climate change into long term macroeconomic analysis and New York University's Paul Romer was awarded for factoring technological innovation into macroeconomics. When Swedish industrialist Alfred Nobel established the prizes in his will, economics wasn't one of the undertakings he wanted honored. 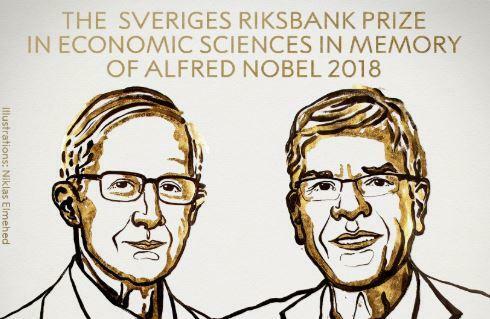 The Nobel Memorial Prize in Economic Sciences was established by Sweden's central bank and first given out in 1969. Last year's win by American Richard Thaler was unusually accessible to the layman -- his work studied the human irrationality that can mess with economic theory. The 2018 Nobel Peace Prize -- the highest-profile of the Nobels -- was awarded on Friday to Congolese doctor Denis Mukwege and Yazidi activist Nadia Murad for their work to end sexual violence against women as a weapon of war.